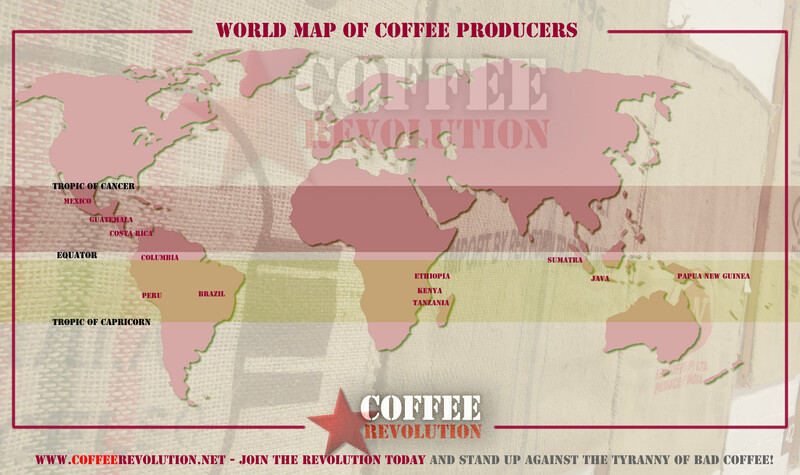 See the major coffee producing regions fall into a band around the equator between the tropic of cancer and tropic of Capricorn. Explore the many flavors and tasting notes peculiar to each region. Most people find they tend to favor one particular source of coffee bean, explore nearby regions and discover new varieties and flavors. Most of the coffee we buy comes from Brazil, Java and Costa Rica but Guatemala, Costa Rica, Columbia, Peru, Brazil, Ethiopia, Kenya, Sumatra and Java all have a fine reputation for exporting quality coffee beans. South American coffee seems to command the highest prices where it can be difficult to harvest, crop and distribute the coffee from.